Senate continues work on bill to address opioid crisis, budget talks hit snag, and the encryption debate continues. 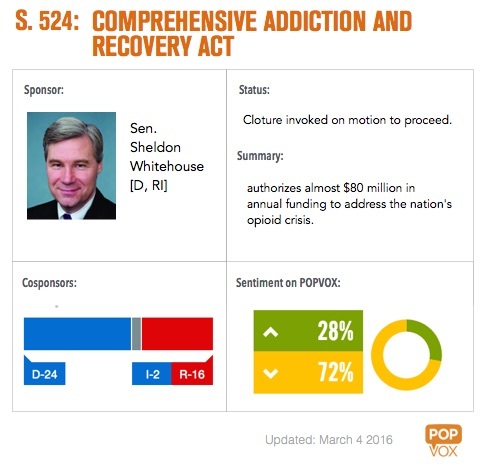 Top Search on POPVOX this week: "s2242"
On Monday, Senate voted 89-0 to invoke cloture on CARA, a bill that would authorize nearly $80 million in funding to address the opioid epidemic. Bill sponsor Sen. Sheldon Whitehouse [D, RI] called for more funding, with Senate Democrats echoing that additional funding is needed. Senate Republicans cited $400 million allocation in the omnibus that passed last December as sufficient funding, specifically $70 million to combat prescription drug overdose abuse. Towards the end of the week, Senate Minority Leader Harry Reid said Democrats needed more amendments or they'd move to block the bill, but later both Reid and bill sponsor Whitehouse said Democrats will not block the bill over amendments, specifically the failed Shaheen amendment that would have added $600 million to combat heroin and prescription drug abuse. The White House signaled support for the bill, highlighting the bill's education programs, increased supply of opioid overdose-reversal drug, and emergency services in rural areas. In statement of administrative policy, Obama administration said the bill contains several necessary steps to combat the opioid epidemic but lacks the necessary funding. Senate Majority Leader Mitch McConnell moved to end debate on CARA on Thursday evening. Senate will take a first procedural vote on Monday at 5:30 pm, with 60 votes needed to overcome the hurdle. Budget talks are snagged on a disagreement between Republicans involving spending levels. Senate Majority Leader Mitch McConnell is pushing House Republicans to stick with last year's budget deal. House Budget Chairman Tom Price presented budget proposal that would adhere to agreed-upon spending level of $1.07 trillion for fiscal 2017 but would hold separate vote on $30 billion in cuts to mandatory spending programs like Social Security. Conservatives dismissed proposal, calling for rule changes that would give rank-and-file members greater influence over government spending. Defense Secretary Ash Carter urged Congress to stick to bipartisan budget agreement, said reopening deal could raise international concerns and Department of Defense needs greater stability to plan its spending levels. The House passed several energy bills by voice vote, including nuclear energy research and development bill (H.R. 4084), bill that would amend the Energy Policy and Conservation Act (H.R. 4444) , and bill that would require the Energy Department to prioritize job training for minorities, women, veterans and displaced workers (H.R. 4583). The House passed bill that requires the president to establish transition councils six months before the election (S. 1172). House Transportation and Infrastructure Committee advanced oil spill bill (H.R. 1684). Bipartisan mental health reform bill is in the works; markup planned for March 16. House passed bill (H.R. 3716) that would create additional reporting requirements for health care providers under the state Medicaid programs and the Children's Health Insurance Program (CHIP). The White House supports passage, saying it "improves program integrity." Senate Commerce, Senate, and Transportation Committee advanced MOBILE Now Act, bill that would improve spectrum availability and broadband deployment by encouraging federal agencies to sell spectrum to private sector (S. 2555). The battle continues over whether Apple can be compelled to assist the FBI in accessing the iPhone of the San Bernardino shooter. On Monday, Apple received a favorable ruling in a related case in ew York: a federal magistrate judge ruled that Apple could not be made to provide access to a phone at issue in a drug case. This was the first time a judge had ruled on the government's argument using the "All Writs Act" from 1789, in what Reuters called a "huge win for Apple." Should the FBI have the right to compel a company to produce a product it doesn't already make, to the FBI's exact specifications and for the FBI's use? … The decisions should be made by you and your colleagues as representatives of the people, rather than through a warrant request based on a 220-year-old statute." — Apple General Counsel Bruce Sewell in prepared testimony to Congress (NPR). A new bill from Reps. Ted Lieu [D, CA-33] and Blake Farenthold [R, TX-27] would preempt new state proposals (most recently in NY and CA) to ban smartphone encryption for phones sold in those states and fine manufacturers for each phone sold. In addition, Senate Intelligence Committee Chairman Richard Burr [R, NC] and Ranking Member Dianne Feinstein [D, CA], are reported to be working on a bill that would compel companies to override encryption technology when presented with a warrant, an effort seen by many as an uphill climb. House voted 238-163 to give brick manufacturers a reprieve from Environmental Protection Agency's new emission standards. Seven Democrats crossed party lines to pass the bipartisan Blocking Regulatory Interference from Closing Kilns (BRICK) Act of 2016 (H.R. 4557), which now heads to the Senate. The White House said it "strongly opposes" the bill because it would "extend indefinitely deadlines for the brick and structural clay industry to limit mercury and other hazardous air pollution." Rep. David Jolly [R, FL-13] introduced a bill that would ban government from buying Apple products until Apple gives the FBI access to encrypted iPhone involved in San Bernardino shooting. Sen. Deb Fischer [R, NE] introduced a bill to address the "Internet of Things" and its spectrum needs. Senate Commerce Committee markup set for April. House Democratic Whip Steny Hoyer and Rep. Phil Rose introduced School-Based Asthma Management Program Act (H.R. 4662). House Foreign Affairs Chairman Ed Royce introduced bill that prohibits Obama administration from returning Guantánamo Bay back to Cuba without Congress's permission. Sen. Lisa Murkowski [R, AK] introduced bill that would mandate labels for genetically-engineered salmon. Sens. Susan Collins [R, ME] and Claire McCaskill [D, MO] introduced Increasing Competition in Pharmaceuticals Act (S. 2615), bill to address FDA's prioritization of generic drug applications. Sen. Elizabeth Warren [D, MA] introduced bill to create "Biomedical Innovation Fund," which would $5 billion annually for medical research at the National Institutes of Health and the Food and Drug Administration. Supreme Court Justice Clarence Thomas asked first question from bench in 10 years. Here's the question that broke a decade of silence. Sen. Chuck Schumer [D, NY] wants the FAA to establish seat-size standards, likening airline passengers to sardines. Medium is hosting community-wide conservation on criminal justice reform — in response to bipartisan Sentencing Reform and Corrections Act of 2015 (S. 2123). President Obama awarded the Medal of Honor to a Navy SEAL who rescued a doctor who had been kidnapped by the Taliban. Special House panel investigating fetal tissue procurement and research practices held first hearing and questioned morality and necessity of fetal tissue research. Vice President Joe Biden announced two-day visit to Israel next week. Nine House Republicans voted against naming a post office for Maya Angelou, citing her support of Cuban leader Fidel Castro. United Nations Security Council voted unanimously to toughen North Korea sanctions. Defense Secretary Ash Carter said Congress must change law so Guantánamo Bay prisoners can be moved to U.S. soil. SCOTUS decided not to take up case challenging Obama administration's pollution control plan for the Chesapeake Bay watershed. Lights went out during Supreme Court oral arguments. Chief Justice Roberts joked they should have paid the bill. Former CBO Chief Doug Elmendorf said Medicare premium support is a way to decrease health care costs. Rolling Stones announced free concert in Cuba later this month. U.S. Dept. of Transportation finalized rule banning electronic cigarettes on commercial flights. Sen. Richard Burr [R, NC] tweeted his love of SPAM (the food not the email junk) and what to do when you can't find a bag to keep your SPAM fresh. FLOTUS, Dr. Jill Biden, Reps. Pelosi and McMorris Rodgers honored women veterans at the Capitol. U.S. Astronaut Scott Kelly is back after a year in space and apparently grew two inches. See beautiful pics from space. Supreme Court Chief Justice John Roberts rejected plea to block contentious air pollution rule for power plants, despite last year's 5-4 ruling that the EPA's regulation is illegal. Speaker Paul Ryan is moving forward with plan to revamp House rules. GOP presidential candidates debated. Here's the transcript and our related bills tweets. 41 Senate Republicans sent a letter to the White House, suggesting President Obama renominate Bush nominees. President Obama, Senate Majority Leader Mitch McConnell, Senate Minority Leader Harry Reid, Senate Judiciary Chairman Chuck Grassley and Ranking Member Patrick Leahy met to discuss the Supreme Court vacancy, and also a lot of basketball. The groups left without any type of consensus. The nomination is coming soon and Senate Majority Leader Mitch McConnell ended with "See you at the stakeout." 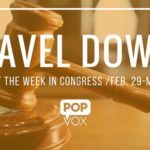 Tell us about your state and what you want to see out of POPVOX/States! New study: About half of Internet traffic is encrypted. New data: Gun manufacturers made 1.4M fewer guns in 2014 then in previous year — biggest year-over-year drop (by percentage) since 2001. NPR examined the rise of unaffiliated voters. New report: Views on ObamaCare remain mixed, both on individual and state level. 35% of people think the healthcare reform helped people in their state, while 27% think it hurt. 15% of people say they have benefitted from the Affordable Care Act, whereas 56% think ACA has not impacted them directly. China reported latest coal consumption levels, putting the country on track to decrease emissions earlier than promised in Paris climate talks. Coal use is down in both China and the U.S.
See how your income compares to other Americans. New numbers show that non profits added jobs throughout Great Recession. Maine Gov. Paul LePage's administration introduced bill to combat Maine's heroin crisis, bill would create new restrictions that would be among the strictest prescribing standards in the nation. Utah Senate voted narrowly to approve a bill that would eliminate the death penalty. Virginia Senate approved bill that would allow parents to block explicit sexual content material in schools. The bill passed the House last month — if enacted, it would be the first state law forcing schools to notify parents about explicit material and allowing parents "to opt out" on behalf of their children. Oregon Senate passed bill to eliminate coal from the state's energy supply by 2030 and double state mandates on renewable power by 2040. Virginia Gov. Terry McAuliffe vetoed pair of bills that would allow home-schooled students to participate in public school sports.